A press release, news release, media release, or press statement is a written communication for a awareness of product, service or a new launch. Press release could also be based on improvement or upgrade of your services & products directed to prospective customers for circulation. As you may already know, the absolute fastest most effortless way to remain in a profitable online business is through bringing in targeted high quality traffic to your website. Selling your product directy to your customer will let you keep 100% of the profits. The best way to achieve this is with the help of Internet Marketing Strategies like Search Engine Optimization, Link Popularity, Press Releases, Blogging etc. 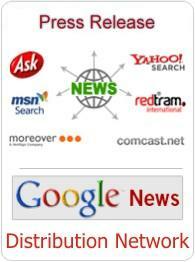 We are here to improve your online business presence with the help of Press-Releases. Our team of experts will improving availability and discoverability easy for your prospective customers. Build your company's publicity to help you get cost-effective leads and sales. Through targeted press campaigns you will get maximum exposure and favourable results for your company. They allow you to express your opinions to a host of issues relevant to your targeted audience. For any of your related requirements, feel free to contact us.